Regarding the cause and consequence of climate change, “we do not enter this debate” say authors A.D. Hüsler and D. Sornette of the Department of Management, Technology and Economics in Switzerland. 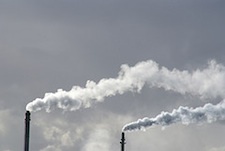 We focus here on the undisputed fact that, due to the massive use of fossil energies, the world economy emits, among many other products, large amounts of carbon dioxide into the atmosphere. Overall, the evidence presented here does not augur well for the future. The human population is still growing at an exponential rate and there is no sign in the data that the growth rate is decreasing. Many argue that economic developments and education of women will lead to a de- crease growth rate and an eventual stabilization of human population. This is not yet observed in the population dynamics, when integrated worldwide. Let us hope that the stabilization of the human popula- tion will occur endogenously by self-regulation, rather than by more stringent finite carrying capacity constraints that can be expected to lead to severe strains on a significant fraction of the population. Notwithstanding a lot of discussions, international meetings, preva- lence in the media, atmospheric CO2 content growth continues un- abated with a clear faster-than-exponential behavior. On the face of this evidence using data until 2009, stabilizing atmospheric carbon dioxide emissions at levels reached in 1990 for instance seems very ambitious, if not utterly unrealistic. We are not pessimistic. We think that only evidence-based decision making can lead to progress. The present evidence gives some measure of the enormous challenges to control our CO2 emissions to acceptable levels. It is hard to escape the conclusion that the US Congress has entered the intellectual wilderness, a sad state of affairs in a country that has led the world in many scientific arenas for so long. Global warming is a thorny problem, and disagreement about how to deal with it is understandable. It is not always clear how to interpret data or address legitimate questions. Nor is the scientific process, or any given scientist, perfect. But to deny that there is reason to be concerned, given the decades of work by countless scientists, is irresponsible. Thomas, before you fall for the conclusions of this paper and go hand-wringing around with it, perhaps you should read a rebuttal at wattsupwiththat.com. It very clearly and concisely shreds the authors conclusions about population growth. All credibility goes out the window at that point. Doug – yes I have no doubt that Watt’s Up With That has a rebuttal. Okay, I’m willing to keep an open mind an consider various points of view. Are you? What other sources of information do you subscribe to besides WUWT? Update – Doug (and others) – I suggest instead of listening to any one (or two) sources, including those we “want” to trust the most, we look for the data ourselves, in this specific case human population growth rate. That goes for Eschenbach as well as the authors cited in this post. What is clear, however, and I’d like to hear the WUWT rebuttal, is that resources are being depleted at an unsustainable rate. [WORDPRESS HASHCASH] The comment’s server IP (74.200.247.111) doesn’t match the comment’s URL host IP (74.200.243.251) and so is spam.